A working parent with one child is considered below the poverty level in the US with an annual income of $15,930 or less, and is therefore eligible for many government services, a recognition by the government that basic needs cannot be met at that income level. A person working full time at 40/hours a week makes just $15,080 (and that’s assuming any time off due to illness, vacation, or slow work periods is paid, which is not a reality for most low-income workers, so the actual income of a minimum wage worker is likely less). The average age of a minimum wage worker is 35 years old and 28% of such workers have children, so this is not just a theoretical calculation. For tipped workers, the situation is even more precarious as they may receive just $2.13/hour and rely on tips, which can be variable, for most of their income. Last year advocates of raising the minimum wage to $10.10/hour suffered a set back when the bill was blocked in Congress, despite popular support. But there is now a clear indication that Senators may introduce an even more progressive bill asking for at least $12/hour for all workers in the United States. Once a bill is formally introduced, there will be plenty of opportunities to show your support, but it is never too soon to build momentum. Share this announcement and let others know why it’s important to support this increase. You can also always call your Senator at 202-224—3121 and let them know you would like to see them support this bill. Our state is doing many things to reduce food and other assistance for the working poor. 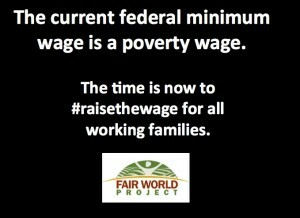 Raising the minimum wage is needed! If the average age of a minimum wage worker is 35, that is not a problem that the minimum wage is low, we need to look at why those workers have not progressed! The minimum wage should be for entry level jobs of high school workers who are being trained. Eliminating them will not help. You are not addressing the real problem.